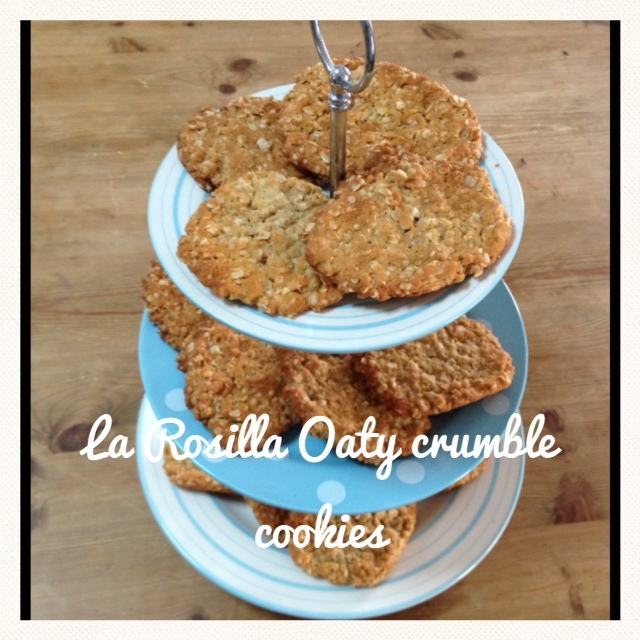 Oats | La Rosilla - Lifestyle and food. ‘Mama there’s nothing in the treat basket’ ‘ it’s empty’ they call. Our treat basket is on a high shelf, that you almost have to climb up-to to reach (purposefully) and we’re all tall in our family. Named as you can guess, as it’s home for sweet treats, nibbles & snacks, not often overladen, more than often poorly lacking, not for want of it being full, but like most families, after a shop, it’s contents are soon to be devoured. My daughter flies back to ‘Blighty’ tonight to return back to college, I’d hate her to go, knowing the treat basket was empty. That’s my ‘ I can be a mum in pinny ‘ inner self thinking 😉 so I’ve rustled up our favourite super quick, oaty crumble cookies. The basket may be empty but the stock cupboard contains all we need to replenish our treat store, and suffice our sweet tooth. Put the above ingredients in a microwavable bowl, and heat on full power for 2 mins to melt. Stir well to make sure all melted. Bake at 150 degrees for approx 10 mins, until just golden. Leave to cool and firm up.